The Chinese University of Hong Kong (CUHK) established partnerships with ETH Zurich, Imperial College London and Johns Hopkins University from the United States here Thursday to deepen ties on transdisciplinary medical robotics research. A signing ceremony was held at the CUHK campus and witnessed by Carrie Lam, Chief Executive of China's Hong Kong Special Administrative Region, Rocky Tuan, Vice-Chancellor and President of CUHK, and Nicholas Yang, Secretary for Innovation and Technology of the HKSAR government. 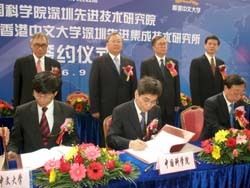 The three top-notch overseas institutions will collaborate with CUHK through the planned Multi-Scale Medical Robotics Center (MRC) which aims to develop effective and accessible imaging and robotic technologies that will reshape the future of medical diagnosis and treatment of diseases in multiple specialties, and ultimately, improve the quality of life of patients. The planned MRC will conduct three major research programs, namely "Endoluminal Multiscale Robotic Platforms for Diagnostics and Therapeutics", "Magnetic-guided Endoluminal Robotic Platform" and "Image-guided Robotic Interventions", covering a wide range of specialties in medicine.